Healthy, Delicious, and Fun to Explore – the Adventure of Tea! Ten Healthy Teas introduces you to the wonderful world of tea, which has many natural health benefits as well as being a beloved part of social ritual, and a comforting way to take a moment for yourself in a busy day. The information and recipes in this book are designed for those who want to explore the world of tea, but who might not have a lot of time to invest. 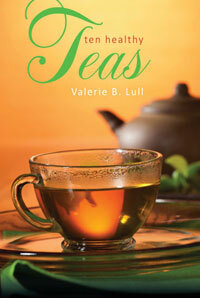 Simple, clear, engaging information provides you with the inspiration to take your own journey into the delights of tea. Whether you prefer traditional black tea or herbal infusions, Ten Healthy Teas is an indispensable guide to healthy, enjoyable tea-drinking. Valerie B. Lull has recently graduated from the American College of Health Sciences with a degree in herbal studies. She has always had a passion for staying healthy, and for the health benefits of herbs and teas and the various ways they can be prepared and used to enhance health. Her passion for tea started in childhood, when she experienced a traditional-style teatime with her Canadian relatives.